Discussion in 'Article Discussion' started by Tim S, 24 Nov 2008. My friend bought one of these and he's pretty pleased with it. Cheap for a DFI board. Solid little performer. No complaints. Pliers. They'll get that screw out. I've even disassembled a harddrive using a pair of pliers to turn the screws when I didn't have the right bit for my screwdriver. I've been kind of thinking about an mATX based gaming rig recently, after all, why do you need a full ATX board? The rear I/O seems a bit sparse of features for a board of this price,esp the lack of esata and a few extra usb ports,or am i being a bit picky? great as a uATX portable LAN box motherboard. That reset CMOS on the back IO panel shouldn't be too difficult to deal with after all it's not like you'll be reaching round the back of a huge coolermaster or Lian li case in this instance. Reaching round the back is pretty easy with a SFF but what can be more difficult is reaching an internal motherboard jumper as SFF cases often have little wriggly room inside! That reset CMOS on the back IO panel shouldn't be too difficult to deal with after all it's not like you'll be reaching round the back of a huge coolermaster or Lian li case in this instance. Reaching round the back is pretty easy with a SFF but what can be more difficult is reaching an internal motherboard jumper as SFF cases often have little wriggly room inside! But for the cost, why not just have a teeny tiny switch ala Abit used to do?? "where the JR P45 doesn't have quite the level of thoughtfulness other DFI products have been given...no Firewire, no eSATA (yet there could easily be)"
Fair enough. Perhaps I should have said compared to the competition then. I've only ever infrequently looked at high end boards to date. eSATA especially - they use a JMicron chipset already for IDE, so one for IDE+2 SATA is little more for a useful extra. As I said above, the CMOS jumper should be a very small momentary switch or two position one. Way too much money for a mATX board, especially with very little features. No point in this board, really. Crossfire on an mATX board is silly and defeats the purpose of small form factor. 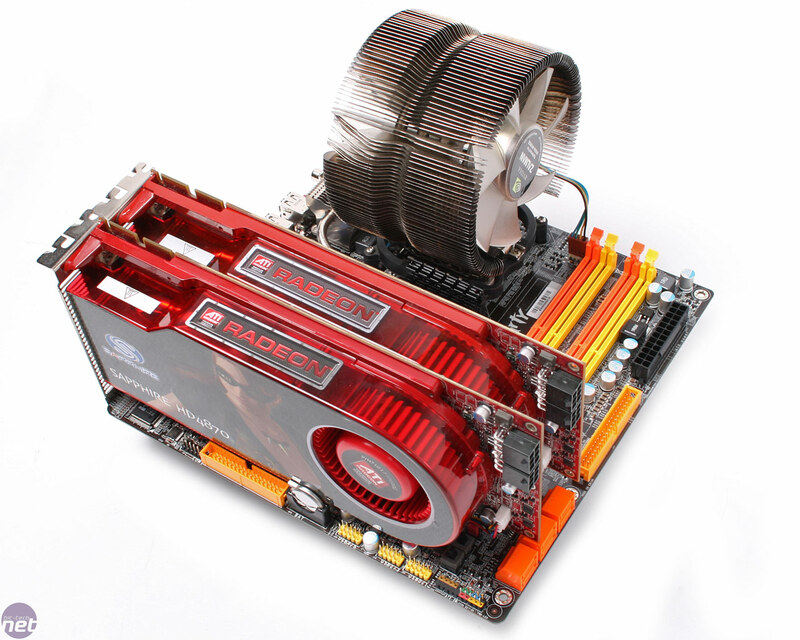 Why have mATX if you are going to shove two gfx cards on it. Can get better boards for a lot less. This board seems completely useless to me. Just my two cents. Can anyone really tell me the benefit of this board? Well, if you dont run any other cards than Graphicscards then a Matx board is big enough, besides, it saves a lot of space in a regular size case which can be used for WC Gear or you can go for a small and great looking case like Silverstone Crown Series. If anyone really wants eSATA with this board, go hunting for the PCI converter dongley thing that Gigabyte supply with their boards. Someone on BT will make a mod for this soon enough. Also, have you checked the box, my board came with some elongated jumpers IIRC, certainly usefull if your case is a pain to open like mine. I was considering getting this for my SFF gaming rig that I take with lans but I think a single x16 lane with a 4870x2 would probably do me better then two x8 lanes. Very nice board. about time another dual grahics M-atx came out was wanting one couple months ago. but not now. But its still bloody nice that photo of it is nuts. Just seen there is a full atx like it. I have been looking for some time to build a media center for my front room, parhaps this is the right board? In your review you have: Four DDR2 memory sockets supporting up to 16GB of memory at 667-1,066MHz. Its only surepose to be: 8gb total ram. Unless you no sumthing dfi dont no. hehehe.